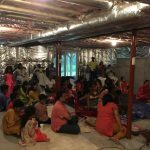 On July 25th, Guru Poornima was celebrated with Akhanda Nama Sankirtan in a grand manner by the Boston GOD Satsang at the residence of Shri Rajesh and Mrs. Nithya Rajesh in Woburn MA. The Akhanda Nama started at 9:30 am and went on until 3:30 pm. 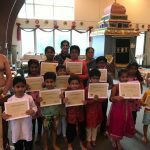 At 3:30 pm, a special Gopa Kuteeram performance was given by the satsang kids – by reciting slokas and singing Bhajans. 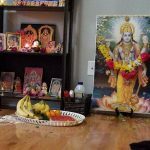 This Gopa Kuteeram meets every Tuesday and is being being coordinated by Mrs. Nithya Rajesh. 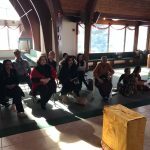 After the Gopa Kuteeram, Dr. Bhagyanathanji’s ‘Madhurasmaranam’ DVD was played, which was watched and enjoyed by all the 30+ devotees who had attended the satsang from places as far as southern Massachusetts and New Hampshire. 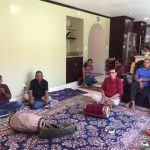 The satsang ended with ‘Kaliyayum Bali Kollum’ kirtan, followed by Prasad.